Pregnant with Cancer: Yes, It's Rescheduled for October 23rd! One cannot imagine how difficult it is to know you have an appointment coming up to make sure your cancer has not returned. Though most of you says "It's still gone, don't worry. You're Fine." There is still that little part that says "But what about this and what about that, and it's possible!!!" So you know, there is this inner struggle. It gets really hard the closer you get to that follow up. The follow up is a combination of anxiety and at the same time relief. You do expect the doc to say "you're fine!". Then you get to feel relief until that next appointment. So you can imagine my dismay when the nurse called to reschedule me. I imagine my doctor had a meeting, conference or some medical procedure to attend to. I am not upset by that. It happens. My appointment however is now rescheduled for the end of the month! I have to start the anxiety process all over again. haha Oh my. I am going to post later about nursing school. This is something I actually started BEFORE I got sick...was very rudely interrupted with cancer and now I'm going to be going back. The kicker in it all? I decided to become an oncology nurse as a result of it all. More on that later. 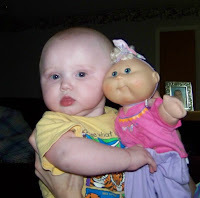 Oh and doesn't Gabriella look like a Cabbage Patch baby??? That pic is from August. I'm loving the Cabbage Patch picture! She's adorable. Sorry your appointment got postponed, hopefully you'll be able to keep your mind off of things but I know it's easier said than done. I don't believe I've been to your site before but I'm glad for EC I found your blog. I can only imagine the anxiety of waiting for what your doctor will say in your follow up appointment. I wish you good health all the way, and goodluck to your plan to return to school. Btw, Gabriella is so adorable. Your daughter is precious! I can't believe they're making you wait so long for your appointment. Sometimes I think doctors have no idea how stressful and nerve wracking it is for patients to have to wait. If I were you, I would call back and tell them to put me on a list for cancellations, just in case something comes up. Sending prayers and wishing you all kinds of good luck! She is beautiful and YOU are amazing!